SecurityStockWatch.com: Thank you for joining us today, Allan. I believe you are the first Presidential Management Intern to join us here at SecurityStockWatch and we are honored to have you. Please give us an overview of your background. Allan Griebenow: Thank you for having me. My Bachelors and Masters degrees are both in business. My father was a U.S. Government civil servant in Washington. While in graduate school I followed his footsteps a bit by working for the government’s telecommunications group in the General Services Administration. Following graduation, I was honored to be NASA’s first Presidential Management Intern. The goal of the program was to bring MBA’s in to improve the Federal Government. At NASA headquarters there, I got involved in advanced satellite communications technology programs at the same time AT&T was broken up and long distance telecom was privatized. That era opened up a whole new world of new applications for communications, particularly wireless. Before starting a satellite engineering business in 1988, I worked for an IBM satellite venture and Ford Aerospace in commercial satellite communications, all focusing on the new uses the technology enabled. I’ve been involved in advanced communications applications my entire career. Once, that involved very large wireless devices in orbit. Now it relates to the smallest of wireless devices in ID cards and tags. SecurityStockWatch.com: One will read on www.AXCESSinc.com that your company’s niche is in providing, “…wireless credentials for businesses encompassing local location identification, tracking, and control capabilities using its patented MicroWireless technology platform.” Please give us an overview of your wireless credentials solution. Allan Griebenow: We developed miniature, very low cost, battery-powered wireless circuits and software, which make up, essentially a tiny wireless computer. We call that computer Dot, and it fits in a card that transmits locally around the enterprise on-command, lasting years and costing only a few dollars to make. MicroWirelessTM is the economic and technological sweet spot for autonomously-powered low cost miniature remote communication devices, eclipsing well-branded yet ill-suited technologies such as RFID, RTLS, Bluetooth, Wi-Fi, ZigBee, and RuBee. We have seven patents on Micro-Wireless now which are fundamental, robust and that IP portfolio continues to grow. SecurityStockWatch.com: Your wireless credentials solution is designed to address 21st Century challenges. What are the advantages of your access control system vs. traditional card access systems. Allan Griebenow: Traditional personnel badges require a slow, cumbersome manual presentation at the entrance to get into a facility, and then they are useless inside. Long range, wireless credentials automatically open doors when approached, and of course only if authorized. Beyond the doorway, they bring real-time visibility into the human activity going on throughout a facility. That visibility increases productivity, security, and safety and provides real-time business intelligence data you simply cannot capture any other way. Our Dot wireless credentials are unique. They open up a whole new world of applications inside the business and for about the same cost as traditional card access systems. The badges look the same as traditional ones, and they are compatible with existing systems. We offer the best of both worlds. So today, we are bringing personnel badges into the 21st century by making them truly wireless, thereby enabling what are called “Advanced Workforce Management” applications throughout the enterprise. SecurityStockWatch.com: There seem to be a large number of applications where AXCESS may provide wireless solutions such as: emergency evacuation, high speed access control, time & attendance reporting, asset utilization, compliance reporting, among many others. What are your key target markets and what is your perspective on the market drivers for AXCESS solutions at this time? Allan Griebenow: Our primary entrance is through the vast global access control market as personnel badges are a standard business practice. Our system was designed for compatibility with legacy access security systems. A key driver is that we are simply sold as a system add-on. And access control is a very large, technologically evolving market. The market has seen the introduction of intelligent cards for ID validation and is now experiencing a transition to TCP/IP network architectures, both of which enhance adoption sentiment for this new technology. Regulatory compliance and reporting requirements are also helping trends. The applications have already been proven-in in vertical industries such as energy, construction, manufacturing, pharmaceuticals, and government, with nameplate reference accounts and ROI-driven business cases. Next, with real-time personnel and asset visibility throughout the organization, we collect the data necessary to open up broad new business intelligence opportunities. SecurityStockWatch.com: When you roll it all up, what is the approximate market size of opportunities which AXCESS is focused on? Allan Griebenow: The access control market today alone is estimated to be $9 billion worldwide. Analysts predict it will grow to $13 billion by 2013. While a great deal of that growth is due to authentication technologies like biometrics, the majority of the growth will come from advanced workforce management applications such as those we are providing. Our goal is to facilitate the wholesale transformation of the market to wireless, and we have a real shot a taking solid market share and even becoming dominant. SecurityStockWatch.com: We read with great interest your recent announcement regarding the successful implementation of a comprehensive security system at the Port of Port of Spain in Trinidad & Tobago where the Fifth Summit of the Americas Conference was recently held. 34 Hemispheric Heads of Government attended including President Barack Obama. That’s very impressive! We also understand that this was pursuant to a $3.5 million port security infrastructure award. Without divulging any confidential information, of course, can you tell us more about the solution AXCESS provided here? Allan Griebenow: Axcess’ advanced system, using a distributed wireless sensors concept included areas such as personnel tracking, WMD sensing and individualized scanning, performed as the primary security system for security personnel. It was used to blanket the Port with broad security threat detection and response capabilities in an unprecedented fashion. Some of the augmented elements included wireless personnel automatic identification and tracking; wireless sensors for toxic chemicals, gases and radiation; an automated threat analysis and response notification system; and scanning for metal objects and other threats on personnel and in baggage. Beyond the deterrence generated by the presence of Axcess’ comprehensive system, the inclusion of multiple scanning capabilities prevented threats from entering the port property. Wireless monitoring of critical personnel and wireless weapons of mass destruction sensors distributed around the facility provided an overlay of automated threat detection, analysis and response. Following the conference, it is being used to address everyday security challenges including prospective terrorism and organized crime, and operational challenges such as worker security and safety. SecurityStockWatch.com: Are there any other “wins” or success stories you’d like to mention? Allan Griebenow: Yes. The list includes security and advanced workforce management solutions. Prior to Trinidad, we provided a similar internal zonal security solution to Barbados Port Inc. Other application success stories for government and the enterprise include a fast building access solution we provided to the large construction firm, Ledcor to increase labor productivity for a large building project. Our system provides automated visitor tracking for security for the Saudi Arabian government in one of their ministries. We announced our solution with Occidental Petroleum for contractor time and attendance data collection, which improves billing accuracy. We automatically protect assets via automated asset-to-custodian linking, for optimizing labor and protecting assets, a solution now securing hundreds of thousands of veterans’ private records at the U.S. Veterans Administration. We provide emergency evacuation accounting as required by law, for improving life safety in the event of a catastrophe; a solution we provided to the U.S. Postal Service. We do real-time personnel performance measurement and have delivered that, for example to assess scientists’ productivity through our industry partner, Siemens. Our automatic compliance reporting solution for management and government agencies has been successful at the Hanford, Washington nuclear reactor super-fund clean-up for years now. Finally, we provide process automation for efficiencies in business where personnel, assets, and material activities are automated together as exemplified by our implementation at HVAC manufacturer, Trane. SecurityStockWatch.com: Congratulations on the recent announcement regarding Microsoft. We understand that AXCESS has successfully implemented its patented Micro-Wireless system into the Microsoft BizTalk Server platform. Care to elaborate? Allan Griebenow: Thank you. We did successfully implement our Micro-Wireless system into Microsoft BizTalk Server platform. BizTalk Server 2009 provides a solution that allows organizations to more easily connect disparate systems, and then process the composite of information through pre-defined rules to automate new areas of business operations. The collaboration between Axcess and Microsoft Corp. will enable the collection of previously unavailable real-time business activity information through our system which as I mentioned earlier wirelessly enables assets, personnel and sensors. The strategic relationship results in an expanded set of tools that customers can use to drive productivity. BizTalk Server is used by ninety percent of the Global 100, including the majority of retailers, hotel chains and the largest U.S. companies in pharmaceuticals, chemicals, railroads, telecommunications and aerospace and defense, opening additional sales avenues to Axcess. SecurityStockWatch.com: We also note that AXCESS has several other very significant strategic relationships with key multi-national industry players such as: ADT, Honeywell, Diebold, and Johnson Controls, among others. What can you tell us about these strategic relationships? Allan Griebenow: Yes. The access control market is vast. It’s served by large global integrators which have a vested interest in augmenting existing systems they’ve provided as well as bringing their current customers the latest technological solutions. Organizations like the ones you have mentioned are reseller partners of ours and they are positioned to lead the wave of introductions for the wireless credential product. We believe we can leverage their sales resources and customer relationships in a classic win-win. SecurityStockWatch.com: What resources such as White Papers, Case Studies and Webinars are available for end-users on www.AXCESSinc.com ? Allan Griebenow: On our website are white papers, customer press releases and application solution notes which support the applications described above and the technology underlying them. We conduct regular webinars for industry verticals which highlight our solutions as referenced by our successes, tailored to the needs of each vertical. Webinar announcements are posted on the web site. The best way to stay abreast of our progress is to sign up for our quarterly newsletters which provide announcements and links to recent events. We of course welcome everyone to contact us directly in Dallas at 972-407-6080. SecurityStockWatch.com: What would you like our audience to know about your patent portfolio? Allan Griebenow: The most important consideration is that our IP is fundamental and protects the various aspects necessary for successful Micro-Wireless operations. The seven patents awarded cover critical things like battery power conservation for credential longevity, multi-frequency operations for proper system functionality, door and gate control operations necessary for security-related application solutions, and architectural designs which reduce overall system costs, etc. We have more than twenty additional applications in various stages of development and examination. Many, like energy harvesting technology which promises a perpetual, non-battery energy source are very exciting. For low power, low cost, miniature autonomous remote device communication solutions, we see very clearly the horizons of technological evolution. We intend to make a big statement in the market and be around for a long time while enhancing shareholder value significantly. SecurityStockWatch.com: Let’s turn to a quick financial overview for a moment. 1Q 2009 is in the books and it was a strong quarter with record revenue. What does the backlog and pipeline look like as we head into 2H 2009 and 2010? Allan Griebenow: On the earnings call in May, we announced record first quarter revenues and we committed to a record second quarter. Further, we announced record year end revenues. 2010 will be a growth year as well as we see a number of new contributing elements including additional Port security deals, an augmented reseller partner channel, the introduction of the Dot Wireless Credentials system into the distribution channel, and new technology partnerships supporting a dramatic new product introduction. SecurityStockWatch.com: Thanks again for joining us today, Allan. Are there any other subjects you’d like to discuss? Allan Griebenow: Thank you for having me. I’d like to close by saying there is now an obvious and well documented trend toward all the things in our world becoming wireless in some fashion. 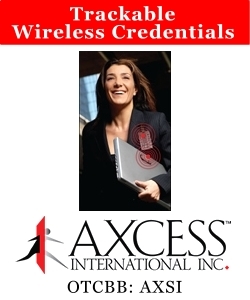 Personnel badges are becoming wireless today via Axcess’ Micro-Wireless technology. So the next time you use your access control card, think about wireless credentials and Axcess International. Of course, also think about our ticker symbol, AXSI.